It turns out Michigan is a beautiful place, but that doesn’t explain the account’s success. Especially in light of “The 17 Most Amazingly Epic Places on Earth“, which Michigan is not. As far as I can see, there are two things that explain the success of this user. Michiganders are weirdly proud of their state. More importantly for marketers, the marketing team behind @PureMichigan is also weirdly proud of their state. That pride shows in their commentary. Which is really all the team does. 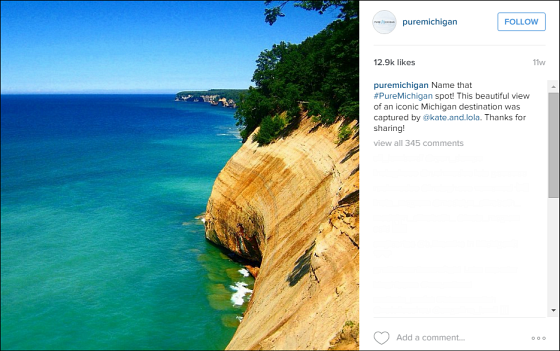 They provide helpful commentary and discussions around user submitted pictures on the hashtag #puremichigan. When a Michigander posts a photo with that hashtag, they automatically give @PureMichigan permission to repost it on the account. The result is a 100% community-driven Instagram strategy that has completely exploded. Credit cards don’t automatically strike you as being particularly visually engaging. And they aren’t. Unless you get artists and Instagram influences to make it so. 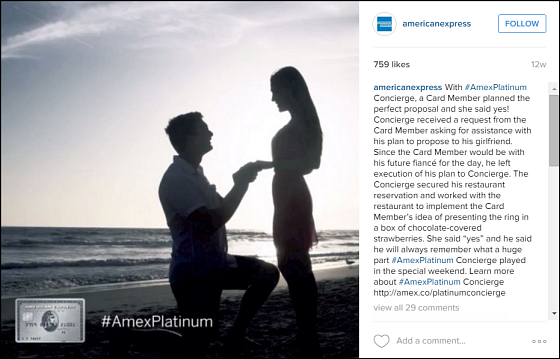 That’s exactly how American Express became the most followed pure credit card brand on Instagram (if you don’t count PayPal). AdWeek has a great write up of its strategy here. It’s a great idea and probably accounts for the majority of its growth. What’s interesting about the account are the stories the brand tells about its customers. AmEx has notoriously great customer service and it shows in their account. I don’t have the data on what can be attributed to pure brand loyalty because of its great products and service, but surely its primary strategy of engaging influencers wouldn’t work without it. State Farm being the most followed insurance company on Instagram was baffling at first. All of its posts are fair to middling at best. About what you would expect from any insurance company on Instagram. After a little digging, I found this. 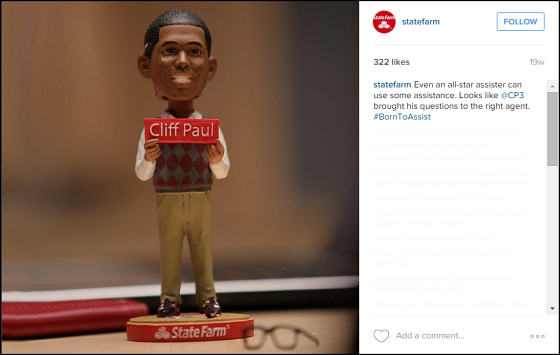 It turns out @statefarm is probably heavily benefiting from residual followers of @cliffpaul, Chris Paul’s fictional twin brother who is a State Farm agent. NBA players are finding huge success on Instagram and State Farm is piggybacking on that success. Not exactly a tactic that can be duplicated, but an interesting lesson in the random successes and failures that happen on social media. 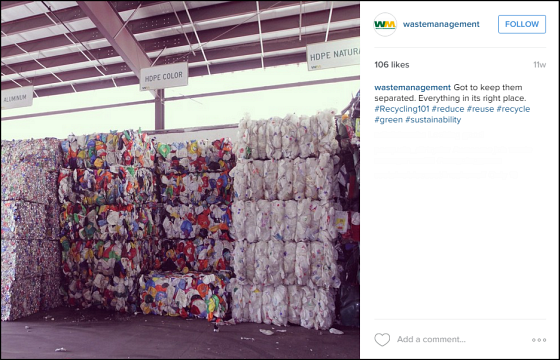 Waste Management has the 134th most followers in the “services” category on Totem’s list. It’s not that impressive when you think of it in terms of overall numbers. However, it is when you consider that it is simply a trash company. If I had to guess, I’d say its success once again comes down to the passion of the person running the account. Trash is incredibly photogenic through the eyes of whoever is managing it. This one is only surprising to anyone who didn’t major in English. In case you didn’t, you should know that there is a small segment of the population that is obsessed with language, wording and grammar. They scour the Web looking for blog posts with typos and leave comments correcting them. They share everything having to do with grammar rules. 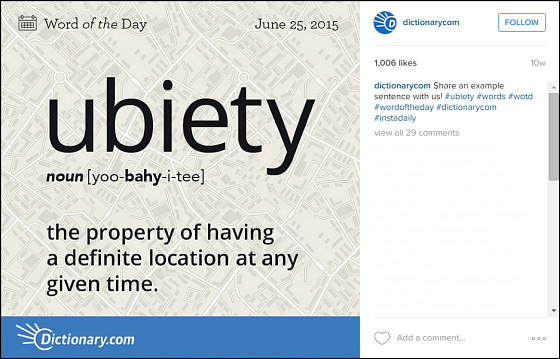 They have given Dictionary.com’s Instagram account enough critical mass to reach 50k+ followers, even though all it posts are pictures of words. Note to self: the secret to success online is pandering to Grammar Nazis. 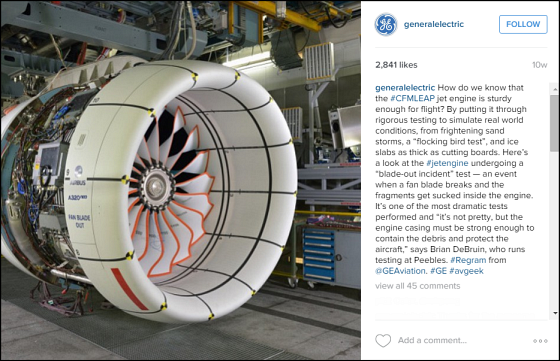 General Electric currently has 187k followers on Instagram. That puts it second only to NASA in Totem’s B2B category. If you disagree with Totem’s placement of NASA in the B2B category (which, as an American taxpayer helping to fund NASA, I do), it puts GE at the top of the B2B list on Instagram. The reason? Its pictures are beautiful. Its commentary is interesting. Ultimately it is highlighting the very core of its value proposition as a company. Which surprisingly has very little to do with the consumer products so many people associate with the brand. GE is a company that is fueled by research and development on the cutting edge of science, and its Instagram account documents it. Don’t avoid huge ships (read the reviews — it’s a thing). Follow it on Instagram. 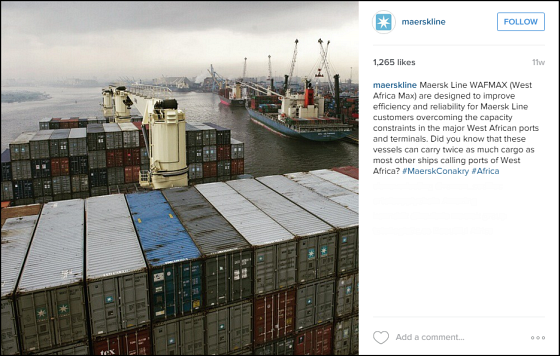 Maersk makes the world’s biggest ships, and it is also doing great on Instagram. It currently has more than 33k followers. Again, even though it is not a consumer brand, its value proposition is on display for the world to see. Its pictures, like GE, have a beautiful industrial look. Add to that the sheer scale of the ships it is taking pictures of and you have a recipe for a great Instagram account. Do you know of any successful brands on Instagram that you wouldn’t expect? Share them in the comments. What an interesting blog post! I’ve just recently jumped into the world of Instagram, and it can be overwhelming. So I greatly appreciate you highlighting brands and explaining how they’ve taken Instagram by storm. Thank you, Paul!